Videos, examples, and solutions to help Grade 5 students learn how to solve word problems using tape diagrams and fraction-by-fraction multiplication. 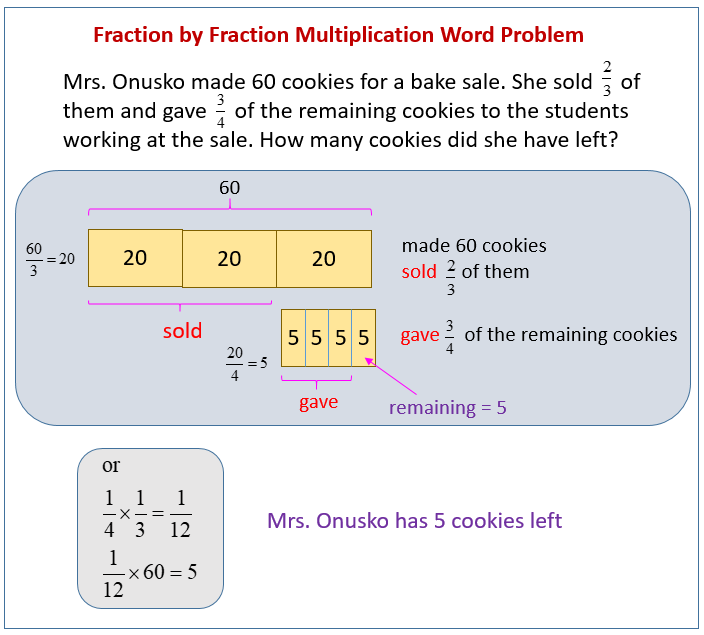 The following diagrams show how to solve fraction by fraction multiplication word problems. Scroll down the page for more examples and solutions. 1. Mrs. Onusko made 60 cookies for a bake sale. She sold 2/3 of them and gave 3/4 of the remaining cookies to the students working at the sale. How many cookies did she have left? 2. Joakim is icing 30 cupcakes. He spreads mint icing on 1/5 of the cupcakes and chocolate on 1/2 of the remaining cupcakes. The rest will get vanilla icing. How many cupcakes have vanilla icing? 3. The Booster Club sells 240 cheeseburgers. 1/4 of the cheeseburgers had pickles, 1/2 of the remaining burgers had onions, and the rest had tomato. How many cheeseburgers had tomato? 5. Milan puts 1/4 of her lawn-mowing money in savings and uses 1/2 of the remaining money to pay back her sister. If she has $15 left, how much did she have at first? 6. Parks is wearing several rubber bracelets. 1/3 of the bracelets are tie-dye, 1/6 are blue, and 1/3 of the remainder are camouflage. If Parks wears 2 camouflage bracelets, how many bracelets does he have on? 4. DeSean is sorting his rock collection. 2/3 of the rocks are metamorphic and 3/4 of the remainder are igneous rocks. If the 3 rocks left over are sedimentary, how many rocks does DeSean have? How to solve complex fractional division problems using tape diagrams and area models? 1. Anthony bought an 8-foot board. He cut off 3/4 of the board to build a shelf, and gave 1/3 of the rest to his brother for an art project. How many inches long was the piece Anthony gave to his brother? 2. Riverside Elementary School is holding a school-wide election to choose a school color. Five-eighths of the votes were for blue, 5/9 of the remaining votes were for green, and the remaining 48 votes were for red. a. How many votes were for blue? b. How many votes were for green? c. If every student got one vote, but there were 25 students absent on the day of the vote, how many students are there at Riverside Elementary School? d. Seven-tenths of the votes for blue were made by girls. Did girls who voted for blue make up more than or less than half of all votes? Support your reasoning with a picture. e. How many girls voted for blue?